Samsung is really making headway with their AMOLED technology. In the first half of 2009 alone, they’ve released about three phones that makes use of their AMOLED screens: the Tocco Ultra Touch, i8910 HD, and the Samsung S7220 Lucido. The first two devices makes use of touch screen technology and only the latter has a candy bar design. Let’s see how the Samsung Lucido fares. 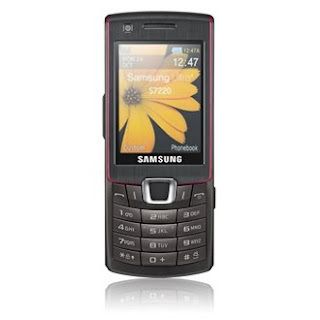 If I have to categorize this phone, since it’s has Samsung’s “S” branding, I have to say that it’s a fashion phone. The Samsung Lucido has a sleek candy bar design with brushed metal effect. The screen kinda brings to mind the Samsung Tocco Ultra Touch’s face. Also, both devices are available in the same red color. The phone is slim and has a solid feel to it although the keypad feels too cramped. Since the Samsung S7220 touts Samsungs excellent AMOLED screen, I quickly downloaded some videos to play on this device. Disappointingly, unlike the Tocco Ultra Touch which can play DivX videos right out of the box, the Samsung Lucido does not support DivX files, only MPEG. I don’t have any MPEG videos lying around so I didn’t have time to test it out. This is really a bummer, the main purpose of an AMOLED screen for me is for video playback so if the phone can’t support DivX playback, the most common video format nowadays, what’s the point? Thankfully, the Samsung S7220 seems to be an excellent camera phone. There are a lot of camera goodies on the Samsung Lucido: autofocus, anti-shake, face detection, smile detection, geo-tagging, LED flash, ISO, etc. These functions are not just empty goodies because they’re all functional. When lighting is adequate (e.g., daylight or industrial fluorescent lights) picture quality is amazing, exposure and saturation are excellent and there’s no noise whatsoever. When in poor lighting conditions, I think the LED flash is pretty useable compared with my Samsung Omnia which pretty much turns the whole picture white with its LED Flash. The flash provides adequate lighting and the night scene mode produces brightly lit photos at the cost of some noise. Music playback using Bluetooth Stereo Headset is excellent although speaker playback leaves something to be desired. It’s okay but when you compare it with other phones such as my Omnia, the Samsung S7220 Lucido’s audio playback through the speakers comes out tinny. Another thing I like about the Samsung S7220 Lucido is the built in document viewer. It’s integrated with Netfront browser. As a web browser, Netfront browser renders pages a bit slowly compared with Opera Mini but for a document viewer it does a good job especially with PDF files. Rendering Word documents is a bit slow though. Like I’ve mentioned, the keypad is a bit cramped especially the two softkeys flanking the directional buttons. With other devices, I was used with the softkeys being located just below the screen but on the Samsung Lucido, it’s located so near the directional buttons that I pressing them can be a pain sometimes. As for the keypad, it can feel a bit awkward the first time you’re using it, like your thumb isn’t in the right place. Over time though, I feel like I might get used to it. The accelerometer only works with the web browser, camera and video player. I don’t really know why they bothered with an accelerometer. It would have been nice if Samsung included some full games and applications that makes use of the accelerometer like what Sony Ericsson did with the G705 but no, all of the games included in the Samsung S7220 Lucido that I got are only trial versions. Like with the Tocco Ultra Touch, there’s no included GPS software although the Samsung Lucido has an edge since even without a GPS software, it can pinpoint your location via longitude and latitude. The Tocco Ultra Touch’s GPS is pretty much useless without a software. If you’re looking for a mobile phone with style, a good camera, GPS and acceptable music playback, the Samsung S7220 Lucido may be just right up your alley. However there might be other older devices that might compete with your attention. The Sony Ericsson G705 for one, is cheaper (unlocked) and already has WiFi but the latter struggles since it isn’t such a competent music player and only has a 3.2 megapixel camera. But if you’re always in the market for something new, the Samsung Lucido definitely delivers. Loved the AMOLED screen and the style. I chose this over the Tocco Ultra since I'm not that much into touchscreens. Great phone! I love the screen too. Too bad it doesn't play divx files. Anybody know a software for the Lucido that would allow me to play divx files?